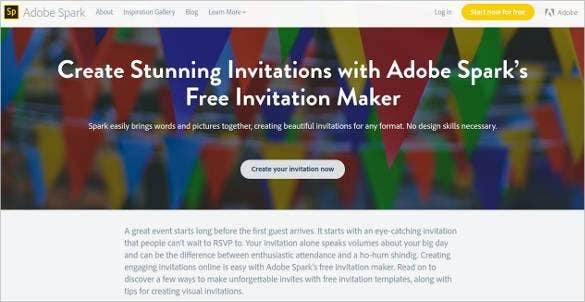 Top Best 12 Online Invitation Makers / Tools to Make Your Invite Worth an Appeal! Invitation cards convey that you are celebrating something special in your life which is close to your heart. The celebrations get even more important when it is joined by the loved ones from your relatives and friends. For every occasion, you ought to have a beautiful invitation card to let people know that they are important in your life and you need their presence and blessings. An invitation which contains the reason for your celebrations, joy and which conveys your celebration in the best possible way. 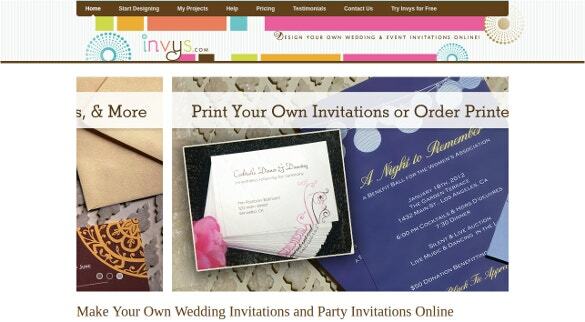 Here are the few websites which are helpful in making a good invitation card. You can also see Invitation Templates. 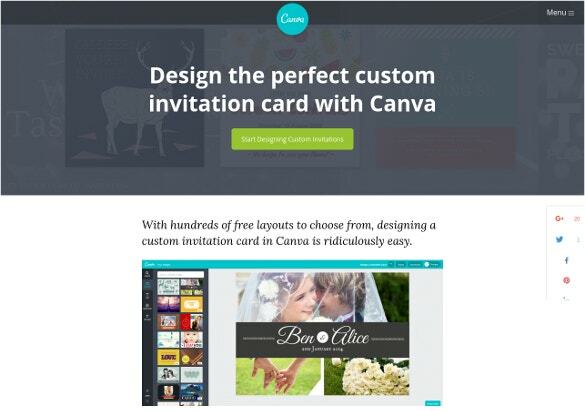 Canva lets you design the card in the best possible way.You can custom your cards from one million stock of images or simply of your own for any occasion you desire. It has got simple steps to make the card which takes only a few minutes to make one beautiful invite. 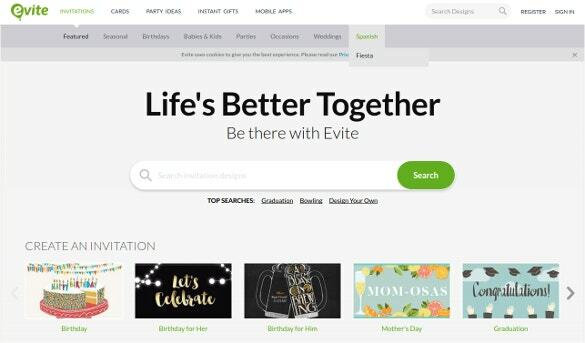 Evite is said to be the most trusted websites which have sent more than two billion invitations successfully. It is easy to use and create online applications. It also carries the feature of tracking RSVP’s easily. Paperless post has got the feature to design the invitation card online and offline both. It carries the featured “designer option” where it has beautiful designs made by the designers of the website. 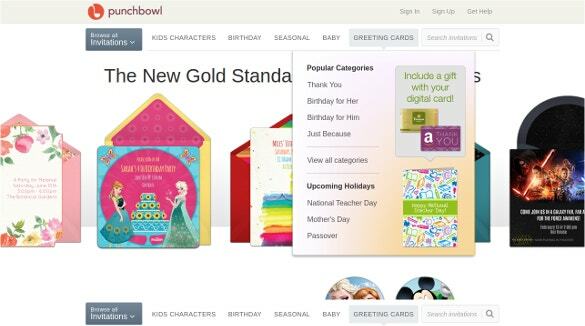 It also has the option where you can design your card according to your own needs and events. Smile box has an application which lets you quickly create and share free invitations online, plus slideshows, photo albums, scrapbooks, greetings in a very personalised way. It also provides the users for a free one week trial. With this tool, you may invite your guests using animated photos, videos and themes. 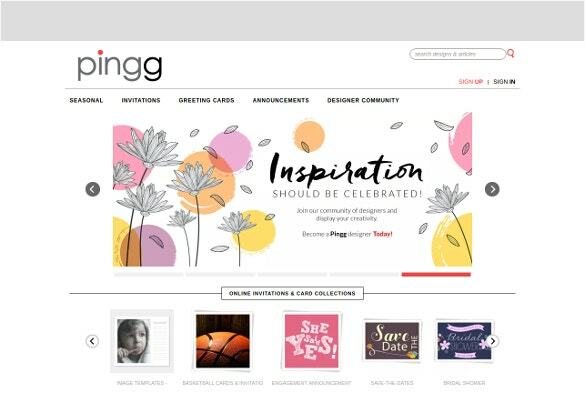 Pingg boasts of having the only website which has an independent designer community. Which speaks of variety of design which is unique for different occasions.It is the best website if you are looking for something which depicts young and innovative. 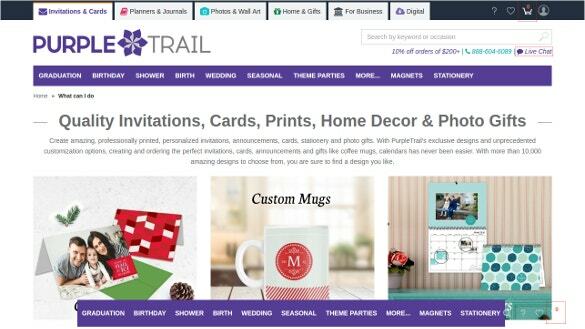 Purpletrail lets you create amazing quality invitations, cards, prints, home decors and photo gifts. It has got more than ten thousand different design to choose from. It allows the users to custom the card as well. Invys is the easiest way to make fashionable and trendy cards. You do not have to download any applications or tools, unlike another website. You can design your card in the best possible way and it charges only when you are ready to print. Invite designs are ready to print PDF’s. Punch bowl allows one to design the invites through mobile, desktop and tablets.You can make the beautiful invites which are handy. This website is dedicated to the mothers who can design their invite in their most easiest of ways. 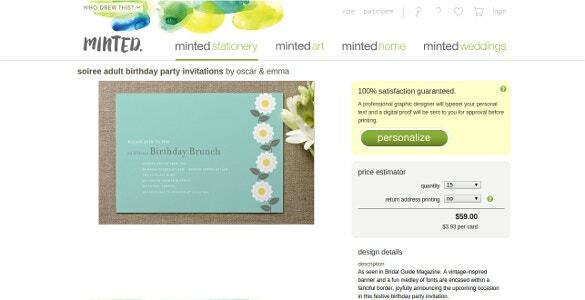 Minted has got all types of invites you need for your celebrations. From birthdays to anniversaries it has the best invite designs all sorted in the website list. This website has got the designers from all over the world which delivers quality designs. Juke box definitely knows how to keep their customers happy. They have the amazing business deals which they offer. They also have an easy tool which allows trendy cards to make in the easiest most manner. They design all sort of design and deliver it right at your doorstep. Adobe Spark is a free of cost graphic design app that is available in both desktop and mobile versions. The app comprises of a number of tools that help you to create images, web pages and videos which can then be used to tell a story or send out messages. Lucidpress is a print and digital publishing software that is available online. it is a drag and drop app that can be used to create awesome content for both print medium as well as digital medium. It can be used to design brochures, invitations, posters, flyers and what not. 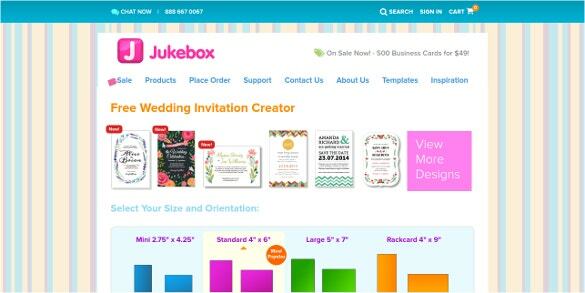 These are the basic online invitation makers tools which can be used for wedding, birthdays, graduation ceremony and all other types of invitation according to your needs. These online application tools are easier to customise. All the above website have the option to buy the product online or design it yourself. Some of the websites has designs from across the globe which is innovative and fresh. Some of the websites allow its users to use it for a trial period later on it can be upgraded to the paid versions.They come in PDF form so printing the invites are easy. To save the paper and cut on the postal charges you can send these invites online as well. The best part about these online invitation maker tools is that you can track your RSVP’s. 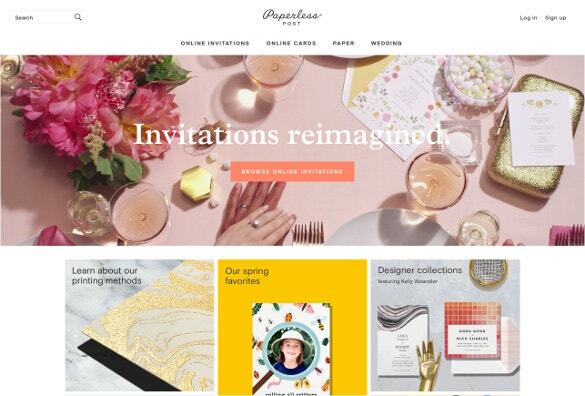 Online invitations maker tools are in vogue these days. It not only saves your time but allows you to put your own creativity in the invite sent. Plus, you are also contributing to the environment by not using the paper. Use the best of your photos and videos to customise your invite. If you are planning a birthday party, wedding or bachelor’s party you know which is the right place to click. Wishing you all the luck for the best party ever! You can also see Typography Online Tools. 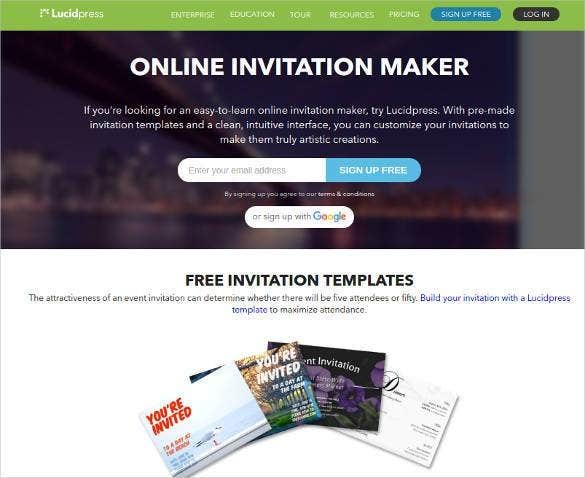 How to Make Invitation Cards Online Free? You can always hire the services of an expert to help you design an invitation card. However, this can sometimes burn a hole in your pocket. Then there might be times when you wish to design your own invitation cards. You can easily do this with the help of invitation card making software and websites that available online. A look at the Top 7 Free Infographics Tools & Online Makers in 2016 will give you an idea of the various options that are available free of cost. You just need to select a layout, impose an image and add in the content to design a perfect invitation card. Wondering how to design an invitation without the help of an expert? Well, check out the tools and online makers to find the best suited software. In order to enhance the invitations with personalized signatures, you can even make use of the Best Email Signature Generators, Tools & Online Makers too. 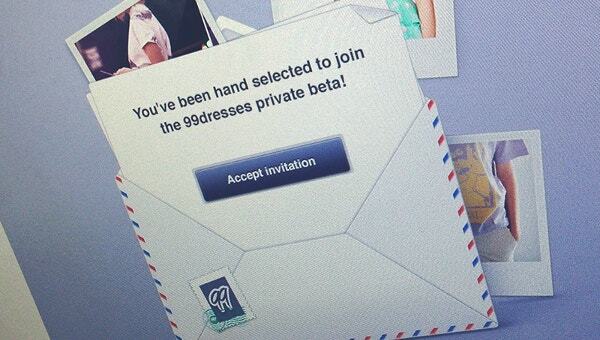 Easy to access and download, customized invitations are now just a few clicks away.